If you happen to take a lot of pictures using your iPhone or iPad, then you know that by default the location-services are on for the camera which makes it easy to geo-tag the pictures. This also helps you maintain a journal of all the places you visited on a particular day. But that’s just pictures; and no text can be associated to it. 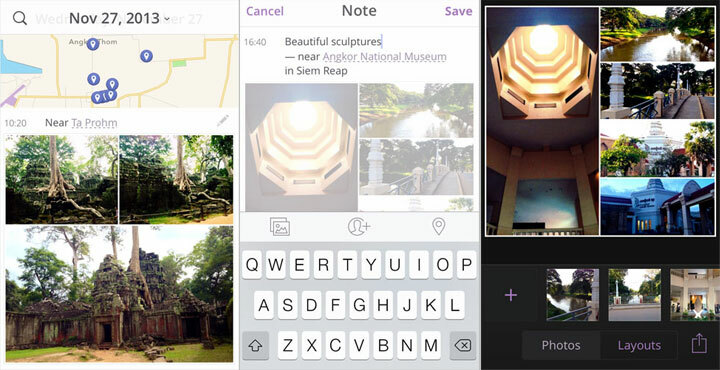 Heyday is an app that brings in every photo you take and their locations to create a journal for you, automatically. This simple app imports your pictures & videos and creates a journal out of it. You can then add notes to the pictures, and although the automatic geo-tagging is not accurate, you have an option to change that as well. The app also allows you to create simple layouts of collages within the picture gallery. Heyday is private, so all your data is just kept on your phone and you don’t have to worry about sharing it with others.